The healthcare that our society provides to veterans is a statement about our collective values. Health Facilities Group is proud to have furnished design services to Harry S. Truman Memorial Veterans’ Hospital that will improve patient experience and safety. Located in Columbia, Missouri, Truman VA serves veterans in 43 Missouri counties and 1 Illinois county. Through our multiple projects at the hospital, HFG has engaged many aspects of veterans’ health, from routine pharmacy needs and acute surgery to behavioral health and patient education. We have cultivated a record of excellence by approaching each VA project as an opportunity to repay the men and women of the United States Armed Forces for their service. Our multiple projects at Truman VA have allowed HFG to fulfill this mission. Pharmacy Addition; Lobby Renovation: This 15,000 SF addition and renovation relocated the Outpatient Pharmacy and an expanded Eye Clinic into new construction. For the pharmacy, HFG incorporated state-of-the-art automated technology, including a Carousel storage and dosage dispensing unit and room for a second unit in the future. To protect pharmacy staff and drugs, all areas to which the public has direct access were secured with features such as reinforced masonry, Kevlar drywall, bullet-resistive glass, and a transaction drawer. Additionally, a renovation widened the lobby and improved flow for veterans and their families by increasing the visibility of Admissions. Patient Privacy Surgery, Phase 1: This project involved the demolition and renovation of approximately 20,000 SF of office space in order to create a new surgery unit. The unit has 18 new single-occupancy patient rooms, including two airborne infection isolation rooms and two rooms for bariatric patients. The project scope also included construction of a new respiratory therapy department, a biomed server room, an external mechanical chase for new piping, and some finishes upgrades in adjacent spaces, such as the main 3rd floor elevator lobby. 2B Behavioral Health Acoustical Study: HFG’s study encompassed sound analysis and modeling of existing acoustical characteristics, deployment of test equipment, and the development of recommendations to improve the situation in the ward through alternative finishes, materials, design elements, or architectural treatments. 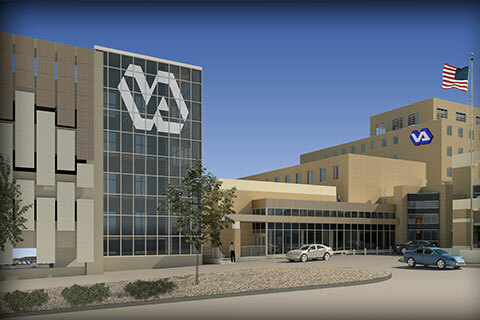 The recommendations were developed based on the VA mental health checklist and infection control criteria and included estimates of construction costs for each option. 2B Behavioral Health Ward Renovation: This 7,661 SF renovation successfully complied with all appropriate codes, regulations, and VA Design Requirements. The project included the renovation of all rooms on the ward, changing the functions of rooms, addressing safety and security requirements for both patients and staff, installing a new staff-assist system, replacing exterior windows, reviewing the mental health checklist, mitigating all identified risks, and designing customized furnishings to meet the safety and security needs of patients and healthcare providers.